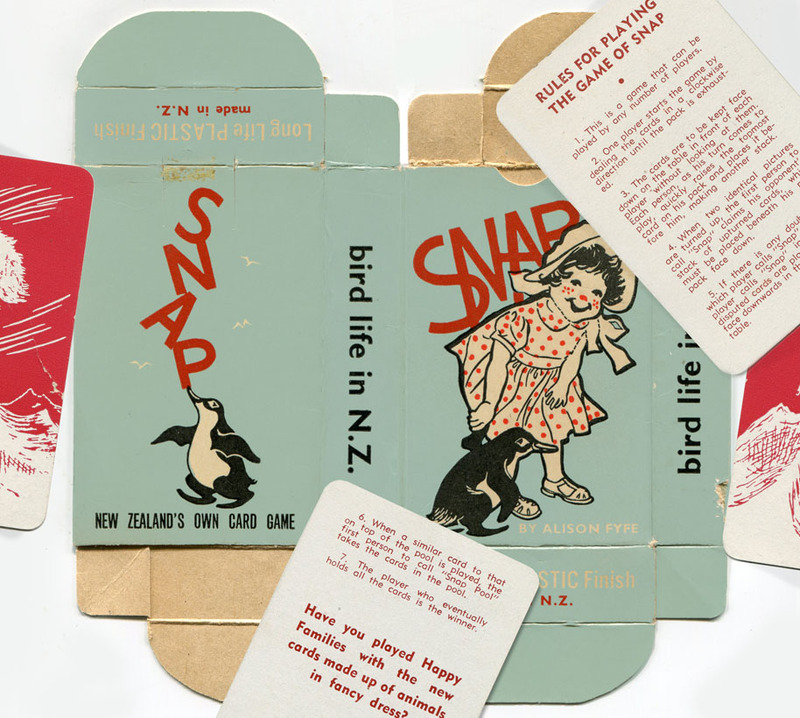 The exterior design of the snap set box, believed to have been designed in the first half of the 1950s. 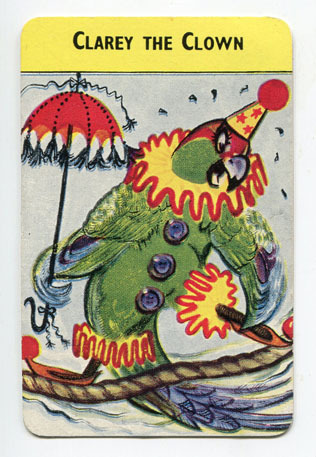 A Kakariki with a parasol balances on a tightrope. 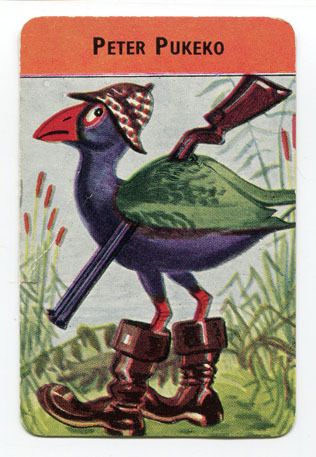 A jaunty Pukeko wobbles on shiny leather boots with his hunting gun; and a studious, spinsterish White-eye in perky red pumps shows off her frock creations in an atelier. 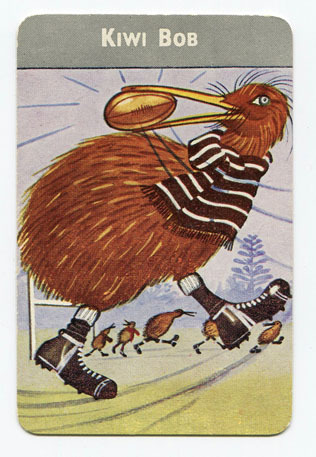 I have wanted to get this card set for a very long time because I love the wonderful, whimsical interpretation of native New Zealand birds. They are a unique rendering of something completely endemic to the country – and in that sense, this item qualifies as true Kiwiana. This set of 36 cards with nine different designs come up for sale perhaps every couple of years at most – and are hard enough to get, especially a complete set – that they were included in a rare book auction earlier this year. Although Alison Fyfe’s name is boldly emblazoned on the box – next to nothing is available on her life before or after this game was produced, so we do not know whether she perhaps had a career as a commercial artist (highly likely) or designed any further products for anyone else. No manufacturer is noted on the box, so it is possible they were even produced independently for sale – her father and brother were lifelong commercial travellers. 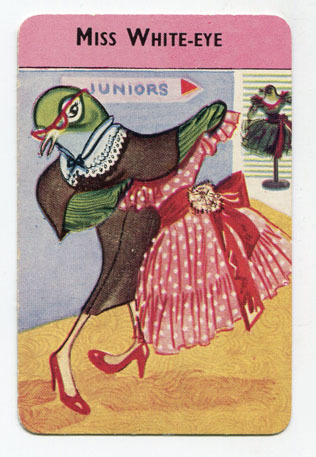 However a card inside makes mention of another Happy Families game of animals in fancy dress, so we can assume she did illustrate at least one other, which has not turned up yet that I know of – but someone must have one somewhere, and I would love to see it eventually. Alison’s grandfather Robert Fyfe originated from Tullibody, Clackmannanshire, Scotland. He married New Zealand-born Annie Clark in Kakanui, near Oamaru in 1886 where he had been settled for at least a couple of years beforehand. This was a heavily agricultural area with rich volcanic soil and a busy port. The couple remained here until at least 1890, but by late 1891 the family were living at Hope Street, central Dunedin. By late 1893 were back again at their Sea View Villa property at Kakanui. 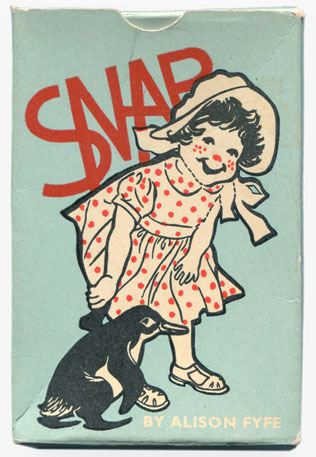 Flattened snap set box showing front and back, and instruction cards – indicating that at least one more set was designed by Fyfe. At some point between 1919 and 1922 he made his way to Auckland, where he met and married Jessie Bruce Buchanan (1899-1974) in 1923, and in the late 1920s they were residing at Saltburn Road, Milford with Robert working as a salesman (he continued to work in this field for the rest of his career). The family settled on the North Shore of Auckland near Jessie’s parents who had their homestead “Whare Oki Oki’ in Clifton Road. Alison was born in 1927, and also had one younger brother – Robert Bruce Fyfe (1930-2007). She attended Takapuna Grammar School in Belmont, where the family moved in the early-mid 1930s to Harrison Road (they stayed here until the mid 1950s). She won a cup in the swimming carnival of February 1942, but out of the pool Alison’s artistic talent became apparent early -winning her in December of that year the headmaster’s special prize for drawing. She had previously entered a number of painting competitions as a youngster – amongst them the “Seen In a Woodland Glade ” competition in which she was awarded a green certificate in March 1939, but prior to that she was a prize winner in the Auckland Star’s “Valentine Painting” competition, of February 1939. Most telling I thought, was her membership to The Sunshine Club. I am not sure exactly what it had its basis in – but it was likely a social group of the sort that was often formed around popular radio shows of the time. Alison joined the Karakas of Takapuna faction. 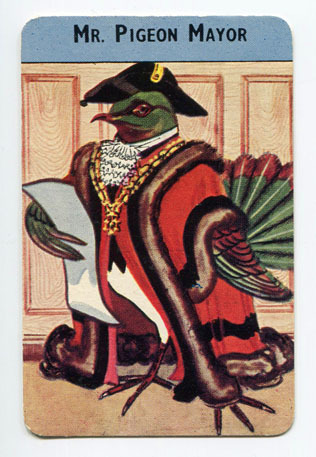 Other sub-groups of the time were the playfully named “Kowhai Kingfishers”, the “Cuckoo Club”, “White Feather Clan”, the “Silver wings”, and “Parakeet Club”, amongst others. 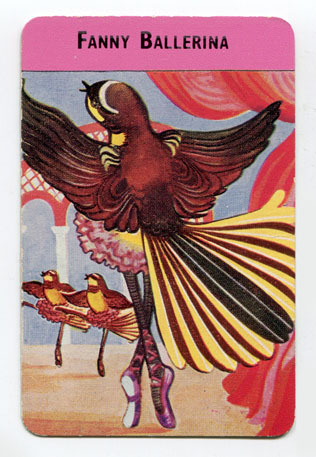 I have no doubt this later influenced her fanciful ornithological illustration work. 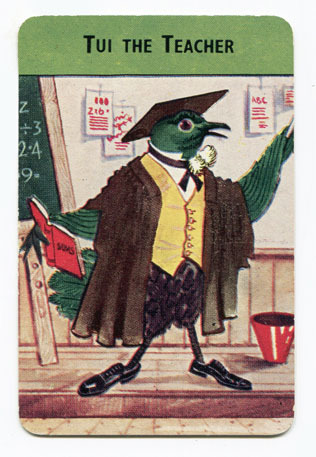 There are also strong influences from Avis Acres’s work; the author of the Hutu and Kawa series of children’s books of the Fifties – with their exquisite illustrations of birds and their humanesque activities and adventures. Some comparing the two may dub Fyfe a second rate version; however I don’t entirely believe this is the case. Fyf’e’s work may not have been quite as skilled or finely rendered- but both are fairly different in approach, in that Acres focussed on a completely natural, contained fantasy world – whereas Fyfe’s concepts were more pop workaday observations with the natural passing into the man-made realm and being placed in human situations. 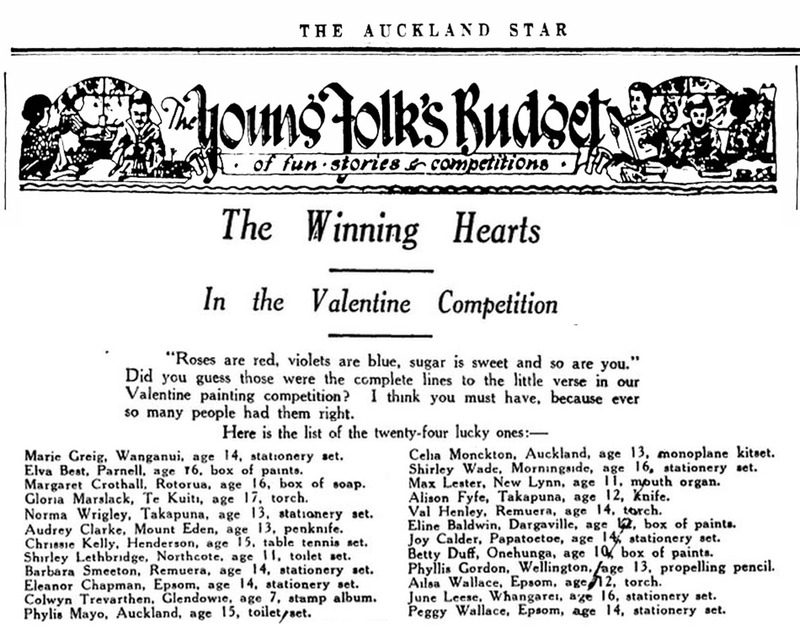 Fyfe wins one of the prizes in the Valentine Painting competition, Auckland Star, 22 February 1939. Courtesy of the National Library of New Zealand. Alison Bruce Fyfe appears once in the electoral rolls living on the North Shore of Auckland in 1949, living at 7 Harrison Avenue with her parents. In 1954 Robert and Jessie have moved to Walter Street, Hauraki, North Shore, Auckland – and Alison is no longer with them. 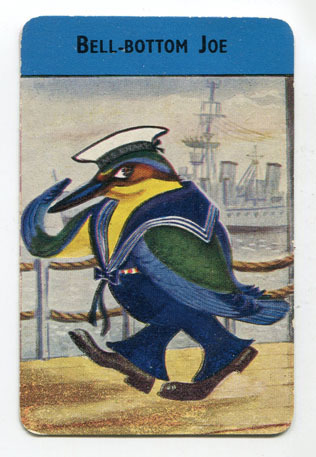 The only further hint on her life is a possible match in Australian records of a Miss A B Fyfe, the correct age, leaving London port and arriving to Melbourne in 1952 – it’s likely that as so many girls of that era did, particularly those with a creative bent – she went off to do her “grand tour” of Europe. 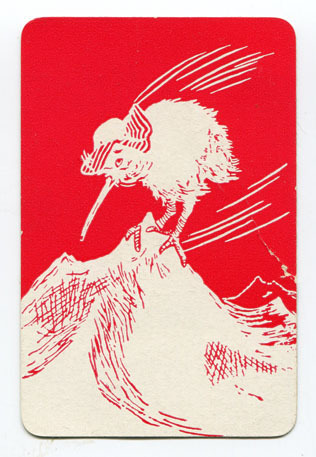 This design of an adventuring Kiwi in a hat features on the reverse of all the cards. And then, she disappears from the records, likely having married. Without being able to find any information on her marriage due to privacy, it’s unlikely we will ever know anything further. It was common for artists to use a nom de plume, especially for women who had established a career before marriage and the inevitable surname change. 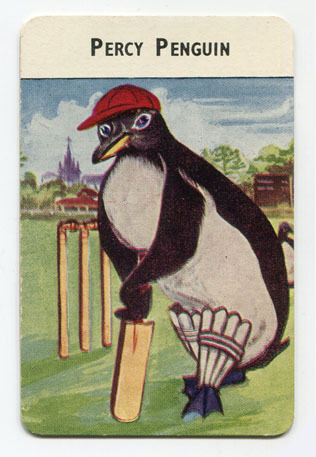 However the fact that she used her maiden name means the cards were likely produced in the first half of the 1950s. In conclusion, I know far more about Alison Fyfe’s family than I know about her work. Maybe a relative, or someone else that knew her – will put their hand up in time.